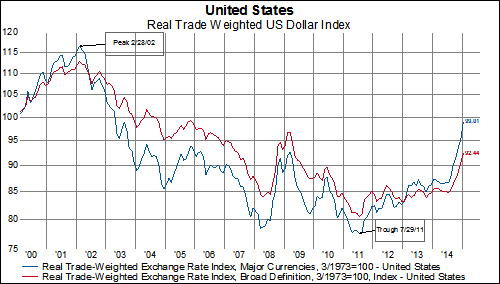 The real trade-weighted exchange rate index against major currencies has reached its highest level at the end of January since April 2003. The broader index is currently at a 69-month high. The major currency index includes six currencies (Euro, Yen, Canadian Dollar, Pound Sterling, Swedish Krona, and Swiss Franc). The broader definition includes 26 different currencies. 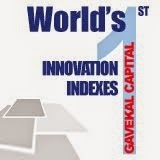 The currency weights are based on yearly trade data. In order to calculate a "real" (i.e inflation-adjusted) exchange rate, the nominal exchange is multiplied by the ratio of US CPI index to the foreign currency CPI index. 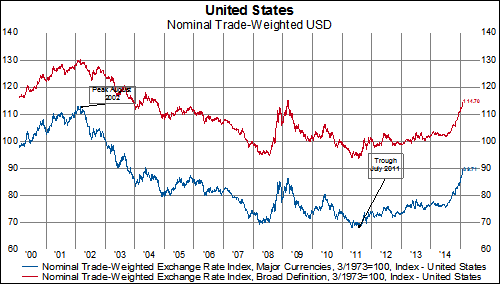 The nominal trade-weighted exchange rate index by major currencies is at its highest level since May 2004, while the broader index is at its highest level since March 9th, 2009 (the infamous start to the current bull market). 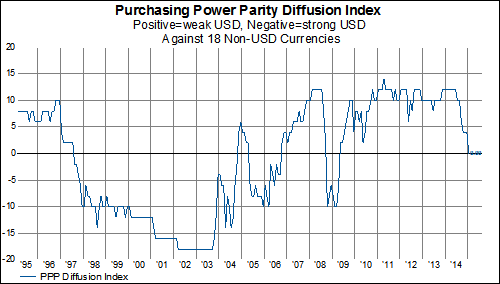 Lastly, our purchasing power parity diffusion index has fallen to 0 for the first time since 2009. This means that on a purchasing power parity basis, nine currencies are currently overvalued versus the USD and nine currencies are undervalued versus the USD.